OLYMPIA — Last week the Insurance, Financial Service and Consumer Protection Committee passed a bill that would add another $100 million to the existing $100 million authorized in the Linked Deposit program. 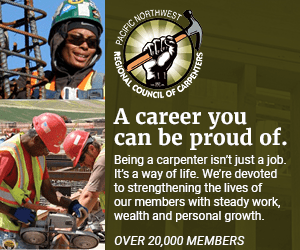 "Small businesses face many challenges today," said Rep. Bob Hasegawa (D-Seattle), who vice-chairs the Finance Committee and is the prime sponsor of the Linked Deposit Program House Bill 1512. "This program has helped many small businesses succeed. But the need is so great that the funds created in last year's bill were quickly allocated." The Washington State Linked Deposit program was first created in 1993. It links the deposit of state funds to loans made by financial institutions to certified minority or women-owned businesses. The state's funds are used to encourage banks to lend to these businesses and buy down the cost of the loans to the small businesses. "The waiting period for these loans can be as long as two years, so in 2005, the Legislature raised the level of funds from $50 million to $100 million, but those new funds were used-up immediately," Hasegawa said. "It's time to expand the program once again." The maximum amount of individual loans in the Linked Deposit program is $1 million and qualifying loan purposes include lines of credit; financing of accounts receivable; working capital; equipment purchases; real property acquisition; and other business-related financing. Hasegawa's new legislation would authorize the State Treasurer to use up to $200 million of short-term state treasury surplus funds for the Linked Deposit Program. Minority and women-owned businesses comprise only 3 percent of the value of the state's contracts when they should be at 28 percent. By helping these businesses with needed resources, the state helps bring diversity and success to an area of small business economic development that needs it. All applicants for these subsidized interest rates must meet the same qualifications and standards that banks impose on any other business — in other words, the loans still have to make good business sense to the banks. There have only been two defaults in the history of the program. "The Linked Deposit program creates hope in the small business community, let's not forget those small businesses are the backbone of our economy," Hasegawa said.